BACKGROUND AND PURPOSE: Spinal MRA has been increasingly used to evaluate non-invasively the spinal cord vasculature. Our aim was to prospectively compare gadobenate dimeglumine with gadodiamide in the assessment of the normal spinal cord vasculature by using contrast-enhanced MRA, with the hypothesis that high T1 relaxivity gadolinium compounds may improve visualization of the intradural vessels. MATERIALS AND METHODS: Twenty subjects underwent 2 temporally separated contrast-enhanced spinal MRAs with gadobenate dimeglumine and gadodiamide (0.2 mmol/kg). Two blinded observers rated postprocessed images on the following qualitative parameters: background homogeneity, sharpness, vascular continuity, and contrast enhancement. Delineation of the ASA, AKA, hairpin configuration of the ASA-AKA connection, and visualized ASA length were recorded. Each observer indicated which of the 2 matched studies he or she thought was of the best overall diagnostic quality. RESULTS: According to both observers gadobenate dimeglumine was superior to gadodiamide in the representation of vascular continuity and contrast (P value < .05). Background homogeneity was not significantly different between the studies. One observer favored gadobenate dimeglumine over gadodiamide in the demonstration of vascular sharpness, while the second observer did not find any significant difference between contrast agents. There was no significant difference between contrast agents in the visualization of the ASA, AKA, hairpin-shaped ASA-AKA connection, and visualized length of the ASA. The overall quality of the gadobenate dimeglumine–enhanced MRA was deemed superior in 15 and 16 cases, respectively, by the 2 observers. CONCLUSIONS: Improved image quality and vascular contrast enhancement of spinal MRA at 1.5T is achieved with high T1 relaxivity gadolinium contrast agents compared with conventional agents at equivalent doses. DSA is the criterion standard in the diagnosis and characterization of spinal vascular lesions.1 Despite its superior spatial resolution, DSA has several limitations: It is a time-consuming and invasive technique that involves exposure to ionizing radiation, it carries a risk of major complications, and can only be performed by expert angiographers. 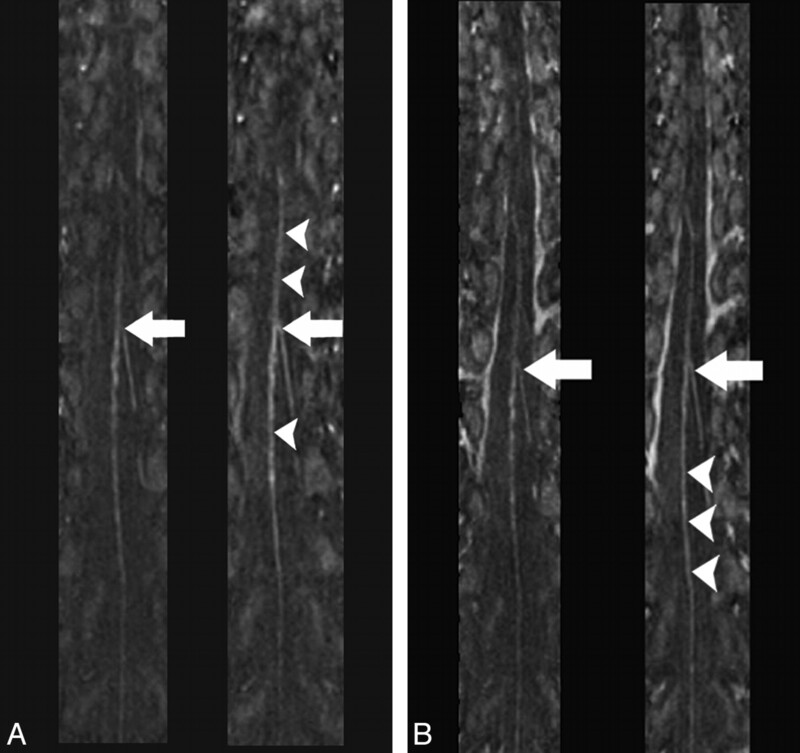 Thus the use of noninvasive imaging techniques to evaluate the intradural vasculature has been pursued in research and clinical practice. Current MR technology meets the requirement of spatial coverage and spatial and temporal resolution to enable the visualization of the main spinal cord arteries.2–4 Nevertheless, spinal MRA remains challenging, and methods to improve vessel visualization in routine clinical practice are highly desirable. The usefulness of gadobenate dimeglumine in MRA has been investigated in multiple vascular regions.11–16 To our knowledge, no prospective studies have been conducted to compare gadobenate dimeglumine with a conventional gadolinium compound in the evaluation of the intradural vasculature by using MRA. The purpose of this study was to determine the potential advantages of gadobenate dimeglumine over a non-protein-binding gadolinium chelate in the assessment of the normal intradural vascular anatomy of the spine by using contrast-enhanced MRA at a 1.5T field strength. Our hypothesis was that the higher T1 relaxivity of gadobenate dimeglumine would result in improved visualization of the intradural vessels compared with a conventional gadolinium contrast agent. This prospective study was a double-blind randomized intraindividual crossover comparison of a 0.2-mmol/kg dose of gadobenate dimeglumine and gadodiamide for contrast-enhanced MRA of the spinal cord vasculature. The study was approved by the institutional review board and was Health Insurance Portability and Accountability Act−compliant. Written informed consent was obtained from subjects before participation. Subjects were enrolled in the study if they met the following inclusion criteria: 1) 18 years of age or older, 2) able to give written informed consent, and 3) willing to undergo 2 MR imaging procedures within 4 weeks. Exclusion criteria were as follows: 1) pregnant or lactating women, 2) allergy to gadolinium contrast agents or other metals, 3) renal failure or class III and IV congestive heart failure (New York Heart Association classification), 4) clinical suspicion or MR imaging findings of a spinal vascular malformation, 5) prior spine surgery, 6) surgical hardware or another possible source of susceptibility artifacts in the spinal or adjacent tissues, and 7) circumstances that would preclude proximity to a strong magnetic field (eg, pacemaker, non-MR imaging−compatible surgical clips, claustrophobia). Twenty subjects (8 men; mean age, 43.7 years; range, 24–77 years) underwent 2 contrast-enhanced MRA examinations of the spine between August 2007 and September 2008 (minimum time interval, 72 hours; maximum time interval, 28 days). Renal function was evaluated before the study, and the glomerular filtration rate was found to be >59 mL/min in all subjects before inclusion in the study. Pregnancy was excluded by means of a pregnancy test conducted within 24 hours before each contrast agent administration (urine β human chorionic gonadotropin) or by history (ie, tubal ligation, hysterectomy, postmenopausal). The contrast agent for each examination was assigned according to a randomization list (SAS, Version 9.2; SAS Institute, Cary, North Carolina) and was administered by an independent drug-dispensing person to ensure blinding of the investigators. Participants were unaware of group assignment. After a 3D localizer scan, standard axial and sagittal T2-weighted sequences of the thoracic and lumbar spine were performed. We used a previously described MRA imaging protocol.18 The FOV of the MRA covered the level of the fourth thoracic vertebra down to fifth lumbar vertebra to ensure that the AKA was included. The study was performed by using a contrast-enhanced 3D fast-spoiled gradient recalled acquisition in the steady-state sequence and the following imaging parameters: TR/TE, 5.9/1.9 ms; flip angle, 30°; voxel size, 0.8 × 0.8 × 0.6 mm3. Sagittal sections were used to obtain the least number of phase-encoding steps and consequently the shortest acquisition time. The k-space was filled by using an elliptic-centric order. Synchronization of the sampling of the k-space center with the peak contrast agent concentration was achieved with power injection through an antecubital intravenous line of a test bolus of 2 mL of contrast material (flow rate, 3 mL/s) by using the dynamic viewing mode of the scanner. The optimal delay time for the spinal MRA was determined as the time interval between the onset of the test bolus injection and the first scan showing intense contrast enhancement of the distal aorta. After the injection of a dose of contrast material of 0.2 mmol/kg of body weight, followed by a 25-mL saline flush by using a power injector (flow rate, 3 mL/s), the contrast-enhanced MRA was performed with 2 dynamic phases, each of a duration of approximately 35 seconds. The second phase began without delay after completion of the first phase. Despite a scanning duration of 35 seconds, the centric k-space filling ensured a difference between the predominantly arterial (first phase) and predominantly venous (second phase) enhancement. The average FOV size was 45 cm in the craniocaudal direction (frequency encoding) and 16 cm in the phase-encoding direction. The second MR imaging examination was performed by using the same scanner, procedures, and technical MR imaging parameters, with a median interval of 12 days (range, 7–28 days). The 2 examinations in each subject differed only in terms of the contrast agent used. Images were evaluated at a multimonitor workstation by 2 blinded observers with 5 and 10 years, respectively, of experience in the evaluation of MRA studies. The MRA images were analyzed by using curved multiplanar reformations and full-volume and partial-volume maximum intensity projection reconstructions of the region of interest (T4-L5 intradural vasculature) by using a commercially available image processing software (Aquarius Net, Version 1.8.2.20; TeraRecon, San Mateo, California). Initial assessment of the studies was conducted by consensus to determine the technical quality of the MRA images. Technical quality of the studies was rated as inadequate, poor, moderate, good, or excellent. Images were considered technically adequate for the following reasons: 1) visualization of the spinal canal from T4 to L5, 2) coverage of the entire width of the spinal canal and neural foramina, and 3) no artifacts compromising image quality. 1) Identification of the ASA. 2) Length of the visualized portion of the ASA (measured in vertebral bodies because the ASA has a curvilinear course). 3) Identification of the AKA. 4) Vertebral level and side of origin of the AKA. 5) Visualization of the hairpin connection between the ASA and AKA. 1) An enhanced structure in the middle of the anterior surface of the spinal cord, brighter during the predominantly arterial phase than during the venous phase. 2) A vessel running through a neural foramen, ascending toward midline and connecting to the ASA with a hairpin configuration, brighter during the predominantly arterial dynamic phase than during the predominantly venous phase. 3) To identify the ASA and AKA hairpin connection, we inspected axial reconstructions of the spinal MRAs, and once this was identified, the course of these vessels was evaluated by using curved multiplanar reformations. The vertebral level of origin of the AKA was determined by using the anatomic T2-weighted images as a reference. The presence of a second vessel with a configuration similar to the that of AKA, corresponding to the great anterior medullary vein, was also noted. If there were 2 vessels draining along the anterior aspect of the spinal cord with a hairpin configuration, the vascular structure that demonstrated greater enhancement in the first dynamic phase and lesser enhancement in the second dynamic phase was deemed to be the AKA. Note that the technique used in this study does not allow isolating the ASA, and venous contamination from the anterior median vein is likely given their close spatial relation and the high likelihood of venous enhancement (duration of the pulse sequence is 35 seconds; average arteriovenous spinal cord circulation time is 10 seconds). A 5-point scale was used for grading: 1, very poor; 2, poor; 3, moderate; 4, good; 5, excellent. Images obtained in each patient were evaluated in a matched-pairs fashion. Finally, during matched-pairs evaluation, each observer also indicated which of the 2 matched studies was of better overall quality. Quantitative assessments of signal intensity were not conducted in this study because the small size of the vascular structures involved (often submillimeter) would not allow a region-of-interest placement entirely within the vessel lumen without partial volume averaging with the surrounding CSF. All analyses and graph construction were performed by using Sigma Stat 3.5 (Sample Power 2.0; Systat Software, Chicago, Illinois) and SPSS 15.0 (SPSS, Chicago, Illinois) software. Descriptive statistics such as frequency and percentage were calculated for all categoric variables. Mean, median, SD, minimum, and maximum were calculated for all continuous variables. Sample size was estimated on the basis of a 2-sided α level equal to 0.05. On the basis of a previous study,19 a sample size of 20 subjects was estimated to provide a 100% power to detect the 42%–49% difference in terms of contrast-to-noise ratio between the 2 contrast agents. Comparisons of categoric variables between the 2 contrast groups were performed by using the Fisher exact test. A P value < .05 was considered to indicate a statistically significant difference. The technical quality of the contrast-enhanced MRA examinations was considered excellent in 4 cases, good in 19 cases, and moderate in 17 cases. Therefore, all the studies were included in the subsequent analysis. The ASA was identified in all MRA examinations (Figs 1 and 2). The length of the visualized portion of the ASA was not significantly different between the 2 contrast agents (average length in vertebral bodies: gadobenate dimeglumine = 5.5 ± 2; gadodiamide = 5.7 ± 2). The segmental origin of the AKA was identified in 14 cases in both MRA examinations performed with gadobenate dimeglumine and gadodiamide. In all 14 cases, the side and segmental origin of the AKA, as determined by the 2 readers in consensus, was concordant between the studies conducted by using gadobenate dimeglumine and gadodiamide (segmental origin of the AKA: T7-T8 = 1; T10-T11 = 1; T11-T12 = 3; L1-L2 = 4; L2-L3 = 4; L3-L4 = 1; in 8 cases, the origin of the AKA was on the right; in 6 cases, it was on the left). In 3 subjects, the segmental origin of the AKA was not identified by using either contrast agent. In 2 cases, the origin of the AKA was only identified on the examinations performed with gadobenate dimeglumine (segmental origin of the AKA: T11-T12 = 1; L1-L2 = 1; in 1 case, the origin of the AKA was on the left; in 1 case, it was on the right); and in 1 case, it was identified only on the examinations performed with gadodiamide (segmental origin of the AKA: L2-L3 = 1; origin of the AKA on the left). 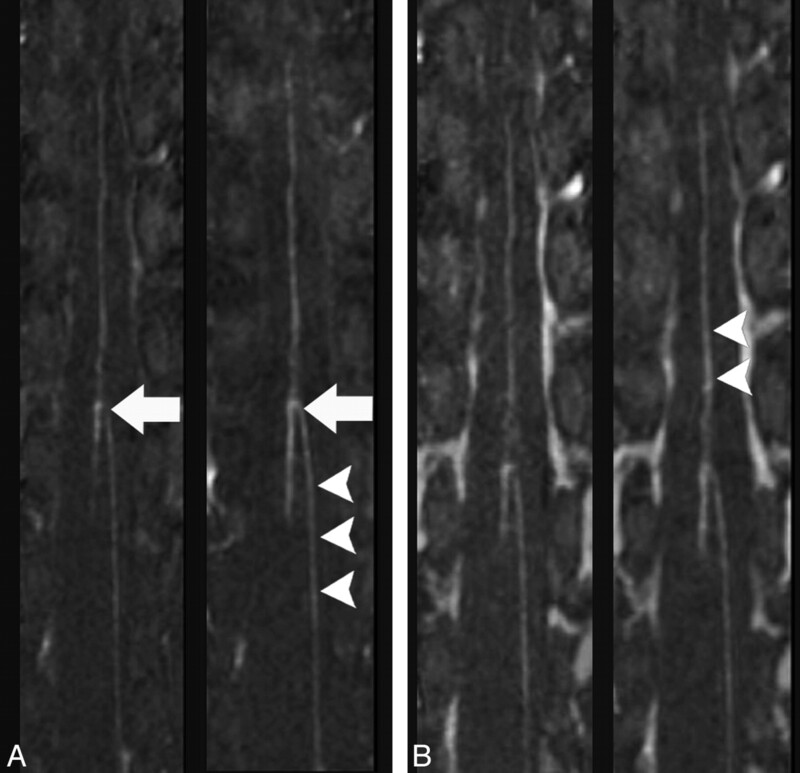 Multiplanar reformation images of the spinal MRA obtained during the predominantly arterial (A) and predominantly venous (B) phases in the same healthy individual by using gadodiamide (left) and gadobenate dimeglumine (right) (TR/TE, 5.9/1.9 ms; flip angle, 30°; 0.2 mmol/kg). The hairpin configuration of the connection between the ASA and AKA is seen with both contrast agents (arrows); however, intravascular enhancement of the ASA appears greater in the gadobenate dimeglumine study (arrowheads). Multiplanar reformation images of the spinal MRA obtained during the predominantly arterial (A) and predominantly venous (B) phases in the same healthy individual by using gadodiamide (left) and gadobenate dimeglumine (right) (TR/TE, 5.9/1.9 ms; flip angle, 30°; 0.2 mmol/kg). The hairpin configuration of the connection between the ASA and AKA is better visualized by using gadobenate dimeglumine (arrows); intravascular enhancement appears greater in the gadobenate dimeglumine study (arrowheads). The hairpin-shaped connection between the ASA and AKA was identified in 17 gadodiamide-enhanced and in 16 gadobenate dimeglumine–enhanced studies. This difference between the contrast agents was not statistically significant. A second vessel draining along the anterior aspect of the spinal cord with a hairpin configuration representing the great anterior medullary vein was identified in 11 cases by using gadobenate dimeglumine and in 9 cases by using gadodiamide. This difference was not statistically significant. The results of the qualitative evaluation are presented in the Table. There was no significant difference in background homogeneity between the MRAs conducted with each contrast agent according to both observers (observer A, observer B). One observer (observer A) favored gadobenate dimeglumine over gadodiamide as far as sharpness of the vascular structures (P < .05). There was no significant difference between the 2 contrast agents with respect to vascular sharpness on the basis of the ratings of the second observer. Both observers deemed gadobenate dimeglumine superior to gadodiamide in the representation of vascular continuity and vessel-to-background contrast (both observers, P < .05). Finally, observer A deemed the overall quality of the gadobenate dimeglumine–enhanced MRA better than that of the gadodiamide-enhanced MRA in 15 cases, while observer B favored the gadobenate dimeglumine–enhanced study in 16 cases (both observers, P < .05). In this study, we performed a prospective comparison of gadobenate dimeglumine with a conventional gadolinium compound in the evaluation of the intradural vasculature by using MRA. The spine and its contents have a unique segmental arterial supply. The ASA travels along the anterior sulcus of the spinal cord and typically originates from the vertebral arteries; the posterior lateral spinal cord arteries originate from the preatlantal vertebral artery or the posterior inferior cerebellar arteries.1 These 3 arteries run along the entire spinal cord from the cervical region to the conus. They would not be sufficient to provide enough blood supply to the whole spinal cord and are supported by radiculomedullary arteries, the largest of which is the AKA, originating at various and unpredictable segmental levels. MRA of the spine is challenging because of the relatively rapid arteriovenous circulation time, spinal cord circulation complexity and variability, and the small caliber of the intradural vessels. The caliber of the ASA and AKA is well known from spinal angiography and autopsy studies.26 The ASA diameter usually ranges from 200–500 μm (cervical region) to 500–800 μm (lumbar region), while the AKA ranges from 500 μm to 1.2 mm. Because a voxel size of approximately 0.4 mm3 was used in this study, we believe that the spatial resolution of the MRA technique was adequate to image the thoracolumbar intradural vessels. Our results show that vessel contrast enhancement, vessel continuity, and overall image quality achieved with gadobenate dimeglumine were superior to those characteristics obtained with an identical dose of a conventional gadolinium contrast agent, though we did not find a significant difference in the visualized length of the ASA. As described in previous intraindividual crossover comparisons of gadobenate dimeglumine and conventional gadolinium agents for contrast-enhanced MRA11–15,27 and other MR imaging applications,28–34 the better performance of gadobenate dimeglumine can be attributed to its greater R1 relaxivity, due to transient and weak interactions of the contrast-effective component of gadobenate with serum proteins.8,9,34,35 The advantage of using gadobenate dimeglumine compared with a conventional contrast agent has been recently investigated in the assessment with MRA of the supra-aortic vessels.16 In this study, the benefit of the increased intravascular enhancement achieved with gadobenate dimeglumine was more evident in the smaller distal cerebral arterial segments than in the proximal epiaortic vessels. In agreement with previous results in various vascular districts, we found that gadobenate dimeglumine provided better definition of the spinal cord vasculature compared with a conventional gadolinium compound. Our study confirms prior observations of the advantage of gadobenate dimeglumine−enhanced MRA and suggests the potential benefit of gadobenate dimeglumine in the evaluation of the intradural vessels. There are some limitations to the study. The size of the sample may have been insufficient to detect differences between the 2 contrast agents in the identification of the site of origin of the AKA and the visualized length of the ASA. However, the use of an intraindividual comparative approach allowed significantly better visualization of vascular continuity and greater contrast enhancement of the intradural vasculature to be demonstrated with the use of gadobenate dimeglumine than with gadodiamide. We used a 1.5T MR imaging unit; however, 3T systems provide improved spatial/temporal resolution, vessel/tissue contrast, and background suppression. In this study, we administered a double dose of contrast agent on the basis of the spinal MRA imaging protocols described in the literature advocating a double or triple dose of gadolinium contrast agent.2–4,18 A single dose of gadobenate dimeglumine (0.1 mmol/ kg bodyweight) with a 3T imaging system has been used with good results in the evaluation of the supra-aortic vessels with MRA16 and requires further investigation in the assessment of spinal cord vasculature. The requirement for high-spatial resolution MRA has the intrinsic drawback of a relatively long acquisition time and potential venous contamination. The circulation time between arterial and venous enhancement in the spinal cord is not precisely known; however, it is probably similar to the 8- to 12-second circulation time within the anterior intracranial circulation.36 The MRA sequence used in this study lasted approximately 35 seconds, which likely results in venous contamination. However, we used an elliptic-centric pattern of k-space acquisition in combination with synchronization of the sampling of the k-space center with the peak contrast agent concentration by using fluoroscopic triggering to minimize venous contamination. Recently, time-resolved MRA, an imaging technique able to achieve scanning times of 6.5–8 seconds per dynamic phase, has been applied to the evaluation of the intradural vasculature.37 This technique allows an improved isolation of the arterial, mixed arterial-venous, and venous enhancement of the spinal cord vessels. The potential advantage of using gadobenate dimeglumine in time-resolved MRA requires further investigation. The use of gadobenate dimeglumine did not result in significant enhancement of spinal MRA diagnostic quality compared with gadodiamide because there was no clear difference in the identification of the ASA, AKA, and level of origin of the AKA between contrast agents. However our findings suggest that improved image quality can be achieved by using high-relaxivity gadolinium agents in spinal MRA. We believe that it is advisable to further investigate whether the improved image quality achieved with the use of high-relaxivity gadolinium agents translates into improved diagnostic quality of spinal MRA when patients with arteriovenous spinal malformations, not healthy controls, are tested. Hence future studies comparing MRA performed with gadobenate dimeglumine and conventional gadolinium compounds in a population of patients with spinal cord vascular malformation are warranted to test this hypothesis, by using conventional spinal angiography as the criterion standard. Our study revealed significantly better qualitative contrast enhancement of the intradural vasculature with gadobenate dimeglumine compared with gadodiamide when these contrast agents were compared intraindividually at 0.2 mmol/kg of bodyweight by using identical scanning parameters at a 1.5T field strength. Although there was no significant difference in the detection rate of the AKA between the 2 contrast agents in healthy subjects, on the basis of the results of our study, we believe it is important to further investigate whether the improved image quality achieved with the use of high-relaxivity gadolinium agents translates into improved diagnostic quality of spinal MRA in the noninvasive identification of the arteriovenous shunt location in patients with arteriovenous spinal malformations. This work was supported by a research grant sponsored by Bracco Diagnostics, Inc.
Paper previously presented at: Annual Meeting of the European Society of Neuroradiology, September 17–20, 2009; Athens, Greece. Accepted after revision October 28, 2009.